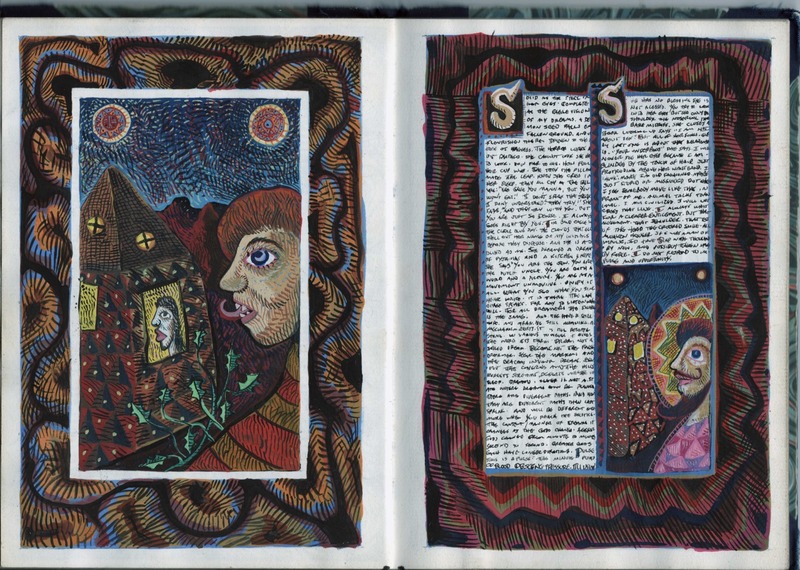 Pages from a handmade illuminated manuscript made by the author. What is the difference, or what are the differences, between Digital Art, and Traditional art? I think that the intention of both is essentially the same, that is, to make cool things. Let me say that again: to make cool things. Sure, we want to express ourselves, we’d like to get rich, we’d like to be famous. We want to change the world, to inspire deep thought, to assist people in prayer and/or meditation. We’d love to be hung in the Louvre, handled by a big New York agent, be featured in artist magazines and discussed by art historians. But lets be honest. All of the above mentioned things are fine and dandy, but more than anything else, we really just want to make cool stuff. Having said that, you might think that I think there is little difference between Digital Art and Traditional Art, but you would be wrong. The inspiration may be similar, but they are very different disciplines. When I make a painting by hand, the image on canvas or paper becomes a document of things that I have done to the paper or canvas. Every mark is the indication of an intended movement, made by my hand, translated by the brush, the pencil, and its intersection with the painting surface. The light that is reflected by the piece moves through multiple layers of substance, each with its own color and viscosity, various levels of translucency and opacity. There are multiple levels to the work, paint built up on glue, built up on wood or paper or canvas. There is the interplay between the surface that is painted upon, and the paint that covers the surface, sometimes concealing that original texture, sometimes not. A skilled painter will fill a surface with paint in ways that make the work intriguing to look at, both as an image, and as an object. Get in close to an oil painting and look at the various emulsions and you see objects that can be jewel-like, or stone-like, or putty-like, waves that rise and fall each representing a pass of the brush. Digital art is a different thing altogether. Regardless of what virtual tools you use, everything is filtered through a monitor, so the flatness of the screen creates a very different surface. When I “paint” on a computer, if I am using a standard Wacom Tablet with my laptop for instance, the tool I draw with, the stylus, is a fixed size. The lines it makes may be larger or smaller, more or less transparent. There is a myriad of ways that different layers in a digital file can interact with each other. The only limit to their diversity is the imagination of the programmer. But in the end, the image has a flat quality we do not encounter in a traditional painting. Does that make the digital work somehow inferior to the traditional one? That would depend on the ingenuity and the visual sensibilities of the artist. Consider that we are used to the idea of seeing our art printed. When we print out a paper copy of a digital artwork, the artifact is different from the image the artist saw on his or her monitor. A monitor is a projection of light. Its luminosity is a factor that doesn’t play into a print. What if the final work were to be presented, not on paper, but on a screen like a monitor – luminous. What if you can turn off the lights in your home or gallery and the images are still visible in perfect clarity? In the not so distant future, we will be able to produce artwork on monitors that share the flexibility and compactness of a sheet of paper. When that happens, when an artist can determine what size the final object is, when it can be installed on a wall as easily as a traditional painting is, will our appreciation for digital works change? I get excited when I think of the possibilities that are opening up. I do a lot of “drawing” on my iPad. There, I don’t have the same disconnect that I get using a stylus with a Wacom Tablet. With the iPad, I use my finger directly on the screen. The iPad and the software it is loaded with react to my finger to produce line, color, shape. The experience is both similar to traditional work, and utterly alien to it. This is a new form, and as photography was not initially accepted by artists as a valid form, there are many contemporary artists who are puzzled by this new form and question its validity. That is, of course, merely part of the process. There is a real revolution coming: when those of us who work in digital forms begin creating art that could not have been made by traditional processes. When this happens, we will be forced to re-evaluate all the arts – it is possible that the old skills will be entirely lost in this shift. I hope not. There is an essence and beauty to traditional forms that is unique and fascinating. It would be a duller world if we were to lose that. Thank you for that very thoughtful essay on art. Traditional art is all you say and for me, that’s one of its weaknesses. I sometimes find that intimidating. Every mark made affects the surface even if it is later covered. For me the advantage of digital art is the freedom to experiment without ruining the piece. In Paper, for instance, I can duplicate once I get to a decision point and try different effects. I can “rewind” — up to a point — if I don’t like the last few things I’ve done. I can erase and redo without degrading the support. Since I’ve started using the iPad my art has become more about the light than about the line, more about experimenting with new ideas than about wanting to get it “right.” Sometimes it’s just about drawing something for the sake of drawing so that I practice, practice, practice. Occasionally I do my experimenting on the iPad and then use the result as a basis for a physical painting once all the tricky bits have been worked out. I love the idea of some sort of monitor with the art on display. Friends ask me why I don’t print some of the pieces I’ve done and the reason is simply that I don’t because it looks so different printed. Seeing a digital work printed is no better than seeing a photo of a traditional work: better than nothing, but so much lost in translation. Hi Helen – thanks for your response to my post! Everything you’ve mentioned is correct! I also love the ability to “undo” mistakes, especially when I’m using a platform that allows me to record the entire painting/drawing process. That way, I can show others where I went wrong, and how I made the corrections. The duplication feature in Paper is a great way to develop an image. Its great that I can save at various points and arrive at different versions of the same piece. Its similar to the process of proofing a print – although most printers only make a few impressions at each state of an image.